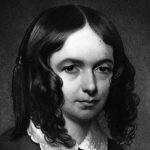 The real name of the British poetess and novelist was Florence Margaret Smith. The name Stevie she took herself, because her friend found her look like the popular jockey Steve Donoghue. Smith was born in the North East of England in the city of Kingston upon Hull. She was the second daughter of Ethel and Charles Smith. The father of the girls worked as a shipping agent in the Admiralty and spent most of his time at sea. He almost did not provide for the family. This had an impact on all subsequent biography of Stevie Smith. When the future poetess was three years old, his mother took the daughters and moved to London to her sister. Women were not wealthy, but thanks to their creativity and wit, both girls got a decent education. Later, Smith took the nickname “Stevie”. Stevie’s life flowed exclusively in female environment. When she was 16, her mother died. Stevie condemned her father for having left the family. The sisters were brought up by Madge Spear, the aunt on their mother’s side. Soon sister Molly left their home. There was only her aunt. Stevie took care of her until her death. The aunt was a convinced feminist, which also reflected on the biography of Stevie Smith: she never married. Stevie Smith gave public readings of poems, performed them to music in concert programs, recorded her poems on BBC and in phonorecords. In the last years of her life, she worked as a secretary of Newnes Publishing Company. Stevie Smith created nine poetry books and three novels: “Novel on Yellow Paper”, “Over the Frontier” and “The Holiday”. There are no emotions of physical love in the poetry of Stevie, her thoughts about her alleged fiancé were somewhat abstractive. Many calm descriptions of friendship, elegiacal landscape lyrics, imbued with love for the motherland are present in her creative work. Many verses of Stevie Smith, in particular, her poem “Not waving but drowning”, are characterized by a sense of dread and inevitability of death. Some of her poems are written in the form of reference to death. Her creative work is also characterized by the negation of religion in the traditional sense, as well as the contradictory attitude towards death (“Oh grateful colors, bright looks!”). Stevie Smith fell victim to a brain tumor, a condition when a mass of cells grows in the brain multiplying abnormally. How did Steve Smith die? She died in Ashburton, Devonshire, England, after a period of acute suffering.